Ceiling Track Hoist - Mountfield Services Ltd. The V5 Duo is a fixed Ceiling Hoist which enables the carer to perform safe lifting with less effort during the transfer of patients with reduced mobility. Manual transfers without the proper equipment is identified as the most common cause of back injuries to the caregiver. Our Ceiling Hoists are safe and easy to use as well as requiring less space to operate than Floor Lifts. The hoists have a lifting capacity of 220 lb (100 kg) and offer an option to change the initial lifting load to a higher capacity of 440 lb (200 kg). 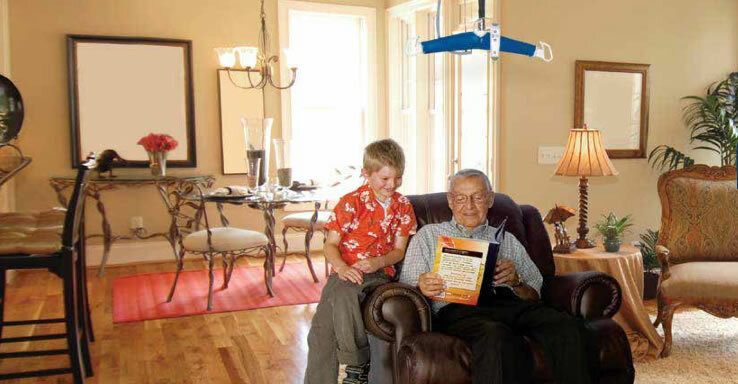 Our Ceiling Hoists can therefore be adapted to various care requirements – either at home or at care homes. To find out more about our easy to use and space saving Ceiling Hoists, dont hesitate to contact our showroom on 0800 4960997. Our new demonstration showroom has working lifts, meaning you can see for yourself how convenient our Ceiling Hoists really are!